Sweet Corn Curry with Nuts and Dessicated Coconut | Authentic Vegetarian Recipes | Traditional Indian Food | Step-by-Step Recipes | Give Me Some Spice! I have always loved sweet corn especially the canned version. I love eating it cold in salads and I’ll often open a small can for my lunch and just eat it cold. This reminds me of my student days!! My sister in law introduced me to Sweet Corn Curry with Nuts and Dessicated Coconut curry (makai nu shak) which I think is her signature dish. I have altered the recipe slightly by omitting the onions and adding cashews and coconut to the dish. If you like your curry to be rich and creamy and slightly sweet, you will like this sweet corn curry. 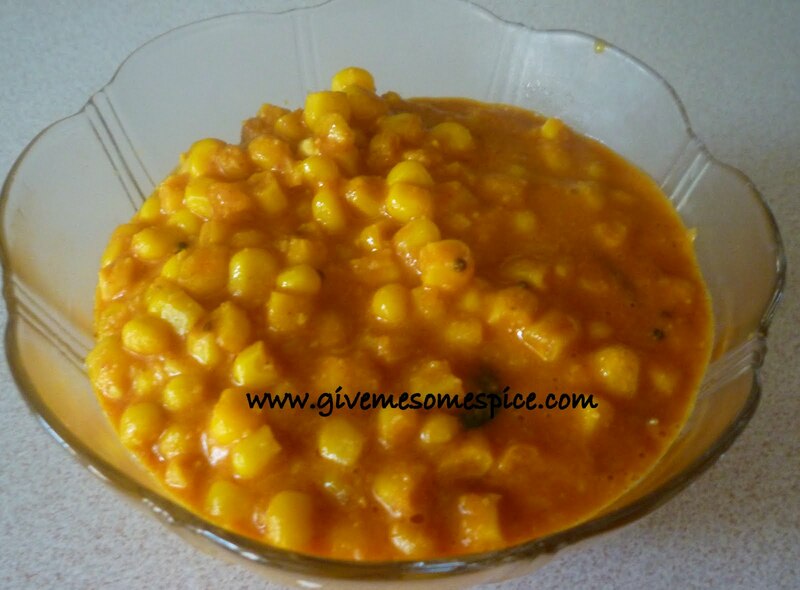 If you use frozen or canned sweet corn, this is a quick and easy dish to make. 1. Heat 2-3 tablespoons of oil in a saucepan and add in the cumin seeds. 2. Once the seeds go dark brown, add the sweet corn and stir. 3. Add the spices – salt, turmeric, chilly powder and stir. 4. Roast the nuts either on a non stick saucepan or for 2-3 minutes in a microwave. 5. Grind the nuts and mix them with the dessicated coconut and keep ready. 6. Add the garlic and once the sweet corn is cooked, add the tomato mixture together with half a cup of water. 7. Now add the ground nuts and desiccated coconut to the mixture. 8. Allow this to cook for 5-7 minutes and serve the curry hot with chapattis or Naan bread.